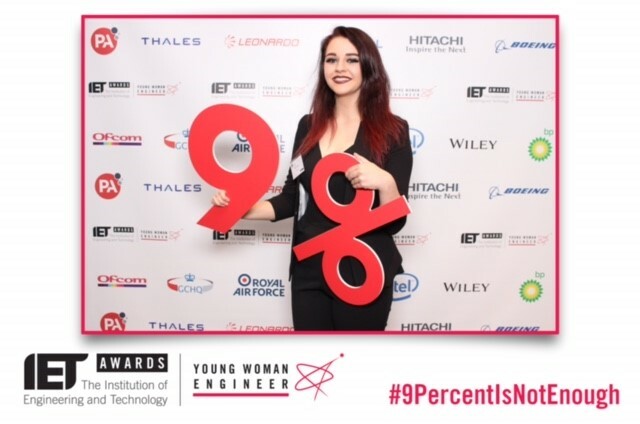 Nadia Johnson, a Digital and Technology Solutions Apprentice at Thales UK, was the youngest shortlisted candidate for the Institution of Engineering and Technology (IET) Young Woman Engineer of the Year Awards 2016. The prestigious engineering industry awards celebrated women working in modern engineering, and as well as highlighting female engineering talent, the IET Young Woman Engineer of the Year Awards seek to find female role models who can help address the UK science and engineering skills crisis by promoting engineering careers to more girls and women. Women currently represent only 9 per cent of the engineering workforce in the UK (source: 2016 IET Skills Survey), the lowest percentage in Europe. Nadia is from a family of engineers and has enjoyed getting hands on from a young age, starting with helping her father work on the family car when she was very young. Nadia attended the IET Young Woman Engineer of the Year Awards ceremony on 1 December at IET London: Savoy Place. Another Digital & Technology Solutions Degree Apprentices, Rachel Calthorpe of AstraZeneca, was named ‘Apprentice of the Year’ at the East Cheshire Business Awards. Rachel had been nominated in the category alongside fellow AstraZeneca apprentice Ryam Coram. We are also very proud to say that Legal Apprentice Dominic McGovern, working in the conveyancing department at SAS Daniels has been shortlisted for Apprentice of the Year at the NW Property Awards. Dominic has also been shortlisted for The Made in Manchester Awards ‘Apprenticeship of the Year’, where he is nominated alongside fellow legal apprentice at SAS Daniels Samantha Lydon. Next Story A great night for Manchester Met apprentices at the Made in Manchester Awards!